Abstract: The Sustainability Education Framework for Teachers (SEFT) intends to build a capacity for educators to be able to understand: (i) the broad, complex nature of sustainability, (ii) the problem-oriented, solution driven nature of sustainability, and (iii) how sustainability connects to them as both citizens and classroom teachers. SEFT embraces four ways of thinking––futures, values, systems, and strategic which are conceptualized as being bi-directional and interconnected. The framework aids in linking sustainability topics that are seemingly disparate to the novice teacher population by building upon knowledge, skills, and attitudes necessary for problem solving with respect to complex sustainability challenges. Imagined as a conceptual framework, it offers organizing principles for examining and considering sustainability problem/solution constellations in a coherent fashion. The framework provides the opportunity for self-reflection and independent enquiry by considering and learning through real world foci. Likewise, SEFT offers a logical framework for working in interpersonal, intragroup, and intergroup situations. The four lenses require considering critical inquiries related to societal values, equity, and visions of the future; unpacking the status quo; and exploring and articulating pathways towards a sustainable tomorrow. The authors, the development team, and the Center for Sustainable Health at the Biodesign Institute thank Arizona State University (ASU) for the generous Strategic Initiative Funds (SIF) provided to form the Sustainability Science Education Project, to develop the Sustainability Science for Teachers course, and other related projects at ASU. The Project was developed under the leadership of Dr. Lee Hartwell. We thank the Center for Sustainable Health at the Biodesign Institute, the Mary Lou Fulton Teachers College, the School of Sustainability, and the Consortium for Science, Policy, and Outcomes located at Arizona State University for advice and many experienced students who helped with the project. A special heartfelt thank you to all current and past Sustainability Science Education Project team members, colleagues, instructors, students, participants, and friends. Educating the next generation on pathways toward a more sustainable way of life is of paramount importance. In order to accomplish this goal, teachers are a vital population with whom to work, and sustainability topics must be woven into teacher education and preparation programs (Nolet, 2009). Engendering a more informed teacher requires translating major sustainability challenges and solutions in a meaningful way together with articulating a deep concern for meeting people’s needs, intergenerational equity, caring for the world’s poor, and safeguarding the Earth’s regenerative capacities (Our Common Future, 1986). Scholars have broadened this understanding to encompass environmental concerns more specifically through science and to denote the ecological relationships that exist between human-nonhuman and flora-fauna-land interactions (Kates et al., 2001; Orr, 1992). To confront these problems, evaluate solutions, and deal with growing inequities, education must be a central component to improving the human condition. A key focus must be on preparing the next generation to make informed decisions, challenge the status quo, and identify problems, as well as solutions. Attending to populations with the potential of having the most catalytic effect is essential to the goals of sustainability. Teachers, their roles in schools, and society at large can work toward significant change for the better. Accordingly, to prepare teachers to take on this challenge, education and training are essential components that must be addressed, evaluated, and improved to meet this need (Nolet, 2009). Our Common Future, the Report of the World Commission on Environment and Development (1987) states that, “the world’s teachers have a crucial role to play” in helping to bring about “the changes in attitudes, in social values, and in aspirations” related to and required for the longevity of our planet (p. 8). Furthermore, Our Common Future highlights that these changes will play out in the public sector through deliberate education and public engagement. Teacher preparation programs must answer this call and work toward a grander vision of preparing educators both as citizens and future leaders to enter a changing world and civic space where problems and solutions related to sustainability are seen as essential (United Nations Education, Scientific, and Cultural Organization, 2004). For purposes of this paper, we shift from the current discourse on sustainability definitions and overarching sustainability competencies to a more teacher-focused and profession-specific vision for sustainability literacy. We highlight and explain the Sustainability Education Framework for Teachers (SEFT) in an effort to rapidly accelerate, inculcate, and prepare teachers with the goals of sustainability through a fundamental shift and transformation in the way they act, think, and engage with the world around them. The framework aids in linking sustainability topics that may seem disconnected to the novice teacher population. It does so by building upon knowledge, skills, and attitudes necessary for problem solving with respect to complex sustainability challenges. The goal of the framework is to build a capacity for teachers to be able to approach: (i) the broad, complex nature of sustainability, (ii) the problem-oriented, solution driven nature of sustainability, and (iii) how sustainability connects to them as both citizens and classroom teachers. The remainder of this paper outlines the Sustainability Education Framework for Teachers and addresses examples of how it can act as an organizing and motivating structure for exploring and operationalizing sustainability literacy as one of several core literacies for teachers. Each element of the framework is defined and includes related abilities and possible teaching strategies. An informative and detailed video accompanies each lens and is meant to act as valuable visual material to further enhance the conversation on sustainability literacy and the framework itself (see the following link for other supplementary videos on SEFT). Overarching and general sustainability competencies have been researched, articulated, and evaluated by the field in recent years (see Wiek, Withycombe-Keeler & Redman, 2011). As described by Wiek et al. (2011), general sustainability competencies take the form of bullet point lists which aim to describe unifying themes, concepts, ideas, capacities, abilities, beliefs, behaviors, and knowledge sets that are required to move towards a greater vision of sustainability. The term competency refers to a wide set of skills, abilities, and behaviors that in theory should be measurable and observable. Currently the field is grappling with which sustainability competencies are the most valuable, justifications as to why certain competencies are essential, and ways to measure each competency. In this paper, we shift the conversation away from sustainability competencies to focus on sustainability literacy for teachers. This articulation provides a transition to a more teacher-centric and profession-specific vision of sustainability (Bertschy, Künzli, & Lehmann, 2013; Church & Skelton, 2010; Cortese, 2003; Nolet, 2009; Sipos et al., 2008; Wiek et al., 2011). The concept of literacy fits well when considering and working with teachers. While there is a subtle difference between competency and literacy, and the terms are often used interchangeably, we believe that professional programs for teachers should consider sustainability literacy among other literacies such as math literacy/numeracy and language literacy. These key literacies and overarching profession-specific skills such as classroom management add up and embody the necessary abilities teachers must encompass for their field. Literacies suggest a collection of skills that, once achieved and formed, can manifest a particular level of competence that can be measured in the future. We use the term literacy as, “a collection of skills that allow for effective participation and influence in diverse areas of social life” (Stibbe & Luna, 2009). Nolet (2009) defines sustainability literacy as various abilities and subsequent actions such as problem solving and informed decision-making. Likewise, the concept of sustainability literacy is described by Tilbury (2011) as more than conveying new knowledge and, “ also means learning to: ask critical questions; envision more positive futures; clarify one’s own values; think systemically; respond through applied learning opportunities; and to explore the dialectic between tradition and innovation” (p. 13). Once teachers gain sustainability literacy, they become empowered to (a) approach society with a critical lens; (b) teach sustainability topics and ways of thinking to their students; (c) make informed decisions; (d) contribute to re-thinking intrapersonal, interpersonal, intragroup, and intergroup conceptions of society and the environment (Bertschy et al., 2013; Nolet, 2009; Stibbe & Luna, 2009). Along with other key literacies, teachers should be able to infuse sustainability literacy into their daily instruction and across the curriculum (Santone et al., 2014). While scholars have worked in the area of sustainability literacy and with sustainability competencies in general, a clear coherent framework for both preservice and inservice teachers has yet to be clearly defined. We propose the SEFT, which aims to support the development of sustainability literacy that builds upon existing work (Bertschy et al., 2013; Nolet, 2009; Stibbe & Luna, 2009; Tilbury, 2011; Wiek et al., 2011) and answers the call for more specific engagement by educators. SEFT aids in linking sustainability topics to existing curricula that may seem unrelated to the novice sustainability teacher population by constructing knowledge and dispositions necessary for problem solving complex sustainability challenges. While distinct sustainability content areas such as water, food, energy, poverty, population, ecosystem services, production, and disposal may appear disconnected, our framework seeks to operationalize the interconnections between and among sustainability-related topics. This framework provides a landscape in which teachers can situate sustainability content knowledge, pedagogy, and craft meaningful evaluations. SEFT embraces four ways of thinking––futures, values, systems, and strategic––which are more than just a list of steps or sets of knowledge that must be acquired. Instead, they are a conceptual framework for analyzing and considering sustainability problems and solutions through a networked approach. These specific four ways of thinking were identified after extensive conversations with sustainability and education experts, reviewing the existing literature, and considering how to prepare teachers meaningfully to take on the role of educating for sustainability. While these four ways of thinking are discussed across the literature in general, they are typically considered in isolation, articulated in a dispersed fashion, and/or examined with complex terminology (Wiek et al., 2011; Stibbe & Luna, 2009; Bollmann-Zuberbuhler et al., 2014). Highlighting and clarifying these four ways of thinking provides an opportunity to strengthen a more robust inquiry of sustainability topics, content, pedagogy, and evaluation. While each of these ways of thinking are presented in a specific order in this paper, they should be considered in parallel as they are conceptualized as being bi-directional and interconnected. Likewise, the logical entry point in the framework presented is dependent upon the problem and/or solution being questioned or observed. Intentionally, this framework is not represented with an accompanying Venn diagram because that type of visual representation may limit creative uses of the framework, create a false sense of overlap, and/or suggest a specific procedure for a given context that was not intended. In addition, SEFT is not meant to be prescriptive. The ways of thinking can be implemented in conjunction with one another or used individually after careful consideration of the topic has taken place. Solutions to sustainability challenges must consider trade-offs and be constructed strategically to maximize benefits and ameliorate negative unintended consequences (Costanza, 2011; Gibson, 2006). Making use of the framework and working through these sets of problem/solution constellations leads to achieving sustainability literacy. Each of the four ways of thinking are described in the following section. Educators should consider the broad range of plausible futures so that we can educate society to envision and create a more sustainable tomorrow. Futures thinking can be used in the classroom by beginning to engage students with multiple possible outcomes of decisions and actions. Students can journal about the variety consequences associated with the choices they make, and teachers can push students to engage beyond the obvious first choice answers. Another idea is to make use of scenarios in the classroom. Scenarios are a tool that teachers can implement to help students think about how the future might unfold. Scenarios can take many forms beyond a written format such as visual, auditory, embodied, kinesthetic and/or verbal. Students can work in groups developing alternative ends to stories they are currently reading or discuss and map out a range of possible outcomes. Thinking about the future also requires an understanding of the past. Knowing where decisions and outcomes originated from can support projections into the future. Teachers can guide students as they conduct a macrohistory, seeking patterns of change, or consider historical trends. Futures thinking asks teachers to explicitly address multiple futures and prepare students to ask questions, think critically about the past, challenge the status quo, and envision tomorrow on a variety of time scales. Values Thinking. Values thinking is also known as value-focused thinking, orientation thinking/knowledge, and/or ethical thinking. Because sustainability is a field that is problem-oriented and solution driven, potential solutions require values thinking. This includes, “the ability to collectively map, specify, apply, reconcile, and negotiate sustainability values, principles, goals, and targets” (Wiek et al., 2011, p. 209). To use values thinking involves concepts of justice, equity, social–ecological integrity, and ethics. It also means understanding how these concepts vary across and within cultures, and how integrating these concepts contributes to solving sustainability problems. According to Veugelers (2000), “Developing skills to analyze values and to communicate them is necessary to show students that values are constructs and that people can make choices for certain values” (p. 39). Due to the complex problems the world faces such as poverty, access to nutritious food and clean water, and our current energy crisis to name a few; solutions cannot arise from a single group or discipline. Rather, solutions need to borrow insights from many fields and areas of expertise in order to understand nature and our interaction with it. Another essential element for values thinking is to consider how our current problems and possible solutions impact a variety of different people. Solutions must be fair to concerned stakeholders and should be transparent in order to be equitable. Just as the development of sustainable solutions should involve everyone affected, solutions should not just benefit a single person or group. To explore values thinking in the classroom, teachers can help students seek different points of view, as well as explore their own feelings and values on various issues. Teachers should demonstrate and exhibit a strong sense of fairness and social justice in the classroom as a model for performance beyond the classroom. This can be accomplished through discussions in which students have the opportunity to ask questions, clarify and analyze their values, and explore others’ values in a safe space. Students should work through techniques on active listening/participation and role-play to allow them to view issues from different points of view. Teachers can also engage students in values thinking through the use of debates and discussions in the classroom. In addition to role-playing and debates, students should be able to ask clarifying questions and explore how values operate in a range of contexts that might not be initially transparent. Teachers should be sensitive to students needs and make sure topics are appropriate for the grade level, culture, and the community in which they are located. Analyze systems with a holistic perspective (Wheeler, 2014). To support systems thinking in the classroom, teachers can help students explore how things might change under different circumstances. Games and models are a great tool to demonstrate this relationship of change under different circumstances. Teachers should encourage students to look at possible associations and connections beyond what is specifically being studied. This is so they can seek possible explanations of these relationships, and realize how these systems often directly impact one another. Students should be actively looking at possible associations and connections beyond the information that is being presented. Teachers can have students review case studies or current news stories to identify transparent and hidden connections. Teachers might consider conducting an institutional analysis, which includes a robust review of existing practices, mechanisms, and procedures currently in place. For example, a classroom project might be unpacking and exploring how food gets to the local grocery store or how specific products relatable to students are produced. Students should actively share findings with their peers and discuss as a class both hidden and visible flows. Teachers should move between local and global examples as a way to highlight the interconnected nature of the world around us. Strategic Thinking. Strategic thinking means being able to develop a strategy or a plan to achieve a particular vision. Strategic thinking frames every decision by how it contributes to achieving that vision. Strategic thinking is, “the ability to collectively design and implement, interventions, transitions, and transformative governance strategies toward sustainability” (Wiek et al., 2011, p. 210). It involves considering possible solutions under a given certain set of assumptions, articulating potential alternative solutions, and challenging existing assumptions and alternatives, potentially leading to new solutions that may be more appropriate (Lawrence, 1999). Strategic thinking involves using analogies and qualitative similarities to create new ideas in addition to developing a course of action dependent on new learning (Lawrence, 1999). This means finding creative ways to solve the critical problems of our time and understanding and working to reduce inequalities. Strategic thinking involves finding opportunities for creativity, innovation, and learning, as well as creating new institutional frameworks for collaboration and better governance. One common stumbling block to strategic thinking is the status quo. The current state tends to exert a lot of influence over future states and can result in path dependency where our current state sets a path for the future. Good strategic thinking takes path dependency into account and can even turn it into an asset or an advantage. Educators can develop strategic thinking with their students by making use of inquiry-based and project-based instruction such as designing, testing, evaluating, and adapting policies, programs, and action plans with their students. This can range from outlining a plan to collect food for a local shelter to suggesting a new after-school program at their school. Strategic thinking can be clearly conveyed in a meaningful way to students when working with real-world problems and solutions. Therefore, it is important to recognize that strategic thinking must be practiced live with real-world situations in order to achieve the particular cognitive activity that is required for this way of thinking. This type of thinking engages students as productive citizens who have ideas that can be implemented meaningfully with care and well-crafted plans. Providing opportunities for students to challenge the status quo, keep an eye on the big picture, and reflect on every step while evaluating their personal progress as well as the group’s progress is key for strategic thinking. 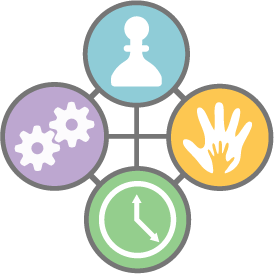 Because this way of thinking is focused on having a vision and working to make it a reality, games and puzzles can be of good use for students to work on strategic thinking. Teachers should encourage students to move beyond the idea of winning as the ultimate result. Rather, strategic thinking is about the process, evaluation, and anticipation of the need to develop and deploy contingency plans for potential unintended consequences of choices previously made. By doing so, teachers can discuss, review, and map out design intervention strategies with their students to avoid undesirable scenarios and to build the necessary knowledge and skills to be able to create meaningful change. Provided as a rich visual resource to complement and promote these descriptions, abilities, and possible teaching strategies are four brief videos on each way of thinking. These videos are made freely available for wide dissemination and use. Articulating the framework in written, auditory, and visual formats is of particular interest for capturing practical use by both scholars and educators alike. The accompanying videos are meant to act as supplemental material to further enhance, explain, and ignite the conversation on sustainability literacy and the four ways of thinking: futures, values, systems, and strategic thinking as presented by the Sustainability Education Framework for Teachers (see the following link for more accompanying information on SEFT). The videos provide easy to follow narratives and examples related to each way of thinking in addition to presenting graphic indicators that capture the essence of these ideas. From text to videos, concepts related to sustainability must be shared in a variety of capacities in order to achieve maximum effect with minimal barriers. The need for integration with sustainability as part of teacher education and professional development is an essential component that is largely being overlooked (Carney, 2011). Although preservice teachers have expressed an openness and enthusiasm regarding infusing sustainability topics in their classrooms, they are often not addressed in existing teacher education coursework (Carney, 2011). As Nolet (2009) writes, “In the United States, educational leaders, particularly those concerned with the preparation of teachers, have yet to respond meaningfully to the issues of over-consumption, human-caused environmental damage, and the global and human catastrophe we are creating” (p. 411). To address this need, SEFT was developed to assist teachers with developing sustainability literacy so they are better prepared to produce globally-minded and knowledgeable citizens. This includes being able to address issues from an intergenerational perspective, embrace stewardship, challenge the status quo, identify the need social justice and fair distribution, respect limits, appreciate the importance of local place, understand the need for economic restructuring, see nature as a model and a teacher, and identify with global citizenship as part of their curriculum (Nolet, 2009). In addition, teachers need to be able to take a global perspective to encourage their students to see that issues, people, cultures, and places are interconnected and that complex systems operate on a variety of transparent and hidden levels. Likewise, teachers need to impart critical thinking skills, which are directly linked to decision-making capabilities (Church & Skelton, 2009). Teachers must spend time grappling with the SEFT approach and deploying the process with their own thinking before they can make good use of it as an educator. Once teachers have a better understanding of SEFT, they can begin implementing the approach as described in their classrooms at their specific grade level. Through the framework, teachers will be able to become more nimble with the problem-oriented, solution driven nature of sustainability and how sustainability connects to the curricula they are already teaching in a seamless fashion. The four ways of thinking described by SEFT offer a way to synthesize and evaluate the many facets of the complex and interdisciplinary field of sustainability in a significant yet unobtrusive fashion in the classroom. Utilizing the framework creates an inquiry-based approach to problem-solving (Bybee, 2002) that leverages student curiosity and promotes search and discovery skills. Because this framework is meant to act as a landscape in which to situate new knowledge and ideas, teachers of all grade levels can make use of it with their students. SEFT can be implicitly incorporated in lesson plans or activities and/or teachers can use the framework to evaluate new materials for their students. SEFT offers four lenses that work together to support a better understanding of the world we live in today and the one we desire in the future. SEFT provides a landscape in which new knowledge about sustainability can be situated. This conceptual framework articulates concrete abilities and teaching strategies for linking pedagogy and learning to the goals of sustainability literacy. SEFT can provide a rich insight into key elements that should be infused into education for sustainability. It can also serve as a guide for meaningful assessment and evaluation of sustainability units, lesson plans, and activities. The authors’ approach provides a unique attempt at articulating, mobilizing, and implementing sustainability literacy for the educator audience in a succinct and coherent fashion. The framework embodies the knowledge, skills, and attitudes necessary for problem solving with respect to complex sustainability challenges. It clearly outlines the aim of sustainability literacy in both written and visual format with the provided videos (SEFT). Our hope is that by leveraging and implementing the framework in the classroom, teachers will be able to introduce vital issues to the next generation of decision-makers, enabling them to face key sustainability challenges of the 21st century. Bybee, R.W. (2002). Scientific inquiry, student learning, and the science curriculum. In R. W. Bybee (Ed. ), Learning science and the science of learning (pp. 25-64). Arlington, VA: NSTA Press. Costanza, R. (2011). Needed: The solutions generation. Solutions, 2(5). Diamond, S. & Irwin, B. (2013). Using e-learning for student sustainability literacy: Framework and review. International Journal of Sustainability in Higher Education, 14(4), 338–348. Gibson, R.B. (2006). Sustainability assessment: basic components of a practical approach. Impact Assessment and Project Appraisal, 24(3), 170-182. Guston, D. H. (2014). Understanding ‘anticipatory governance’. Social Studies of Science, 44(2), 218-242. Holifield, R., Porter, M., & Walker, G. (Eds.). (2010). Spaces of environmental justice. Chichester, West Sussex, U.K.; Malden, MA: Wiley- Blackwell. Kates, R., et al. (2001). Sustainability Science. Science, 292 (5517), 641-642. Kurtz, L. (2008). Encyclopedia of Violence, Peace, and Conflict. (Vol. 2). Academic Press. Kuhlmann, S. (2001). Future governance of innovation policy in Europe — three scenarios. Research Policy, 30(6), 953-976. Meadows, D. (2008). Thinking in Systems: A Primer. White River Junction, VT: Chelsea Green Publishing Company. Newman, P. & Jennings, I. (2008). Cities as sustainable ecosystems: Principles and practices. Washington, DC: Island Press. Norton, B.G. (2005). Sustainability: A philosophy of adaptive ecosystem management. Chicago: The University of Chicago Press. Orr, D.W. (1992). Ecological literacy: Education and the transition to a postmodern world. Ostrom, E. (1990). Governing the commons: The evolution of institutions for collective action. Cambridge, MA: Cambridge University Press. Robinson, D. K. R., Huang, L., Guo, Y., & Porter, A. L. (2013). Forecasting innovation pathways (FIP) for new and emerging science and technologies. Technological Forecasting and Social Change, 80(2), 267-285. Robinson, J., Burch, S., Talwar, S., O’Shea, M., & Walsh, M. (2011). Envisioning sustainability: Recent progress in the use of participatory backcasting approaches for sustainability research. Technological Forecasting & Social Change, 78, 756-768. Rockström, J., Steffen, W., Noone, K., Persson, A., Chapin, FS. III, & et. al., (2009). Planetary boundaries: Exploring the safe operating space for humanity. Ecology and Society, 14(32). Rolston, III H. (1994). Value in Nature and the Nature of Value. In Attfield, R., & Belsey, A. (Eds. ), Philosophy and the Natural Environment (pp. 13-30). Cambridge University Press: Cambridge, UK. Selin, C. (2007). Scenarios for Success: Turning Insights into Action. Arizona State University In Sharpe & van der Heijden, 27-52. Stibbe, A. & Luna, H. (2009). Introduction. In A. Stibbe & H. Luna (Eds. ), The Handbook of Sustainability Literacy Skills for a Changing World (pp. 9-16). Cornwall, UK: Green Books Ltd.
Wiek, A., Withycombe, L., & Redman, C. L. (2011). Key competencies in sustainability: A reference framework for academic program development. Sustainability Science, 6(2), 203-218. Veugelers, W. (2000) Different ways of teaching values. Educational Review, 52(1), 37-46.